“What would contouring be without a highlighter? High Beam by Benefit adds the perfect tint of shimmer to your cheeks. Using a round tear-drop shaped brush will make all the difference. Brush the highlighter along your cheek above the contour line and blend for the perfect radiant glow." It's almost spring, but we not quite there yet! At this point, like us, you're probably tired of pale, dry skin and in need of a major sun-kissed look. While trips to the beach may be in your future, we've got the best tricks to get a sun-kissed look right now! 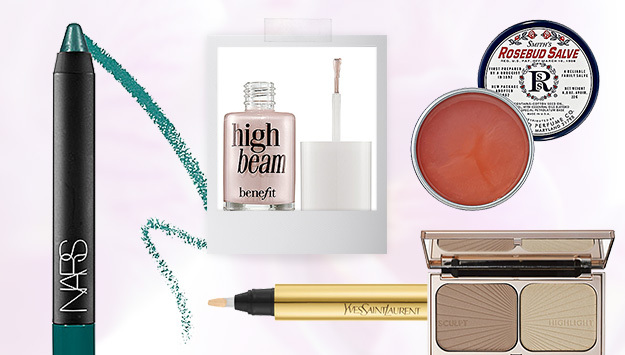 With the help of our guest editor Molly Sims, check out how she gets this look with the help of celebrity makeup artist Joey Maalouf. Molly explains step by step how to get this flawless look in the gallery above! We've got the products used on Molly!